In the past it was said that great surgeons made large incisions. Though that might have been true at a time, over the years the aim has been to reduce the surgical aggressiveness to achieve the best results while minimising the amount of damage. For this purpose, the microscope, and then the endoscope, were introduced. The endoscope, in particular, is a flexible tube that incorporates a light and a rod lens and allows the surgeon to see inside a hollow organ or body cavity, which is usually accessed through a natural orifice or small incision. It is part of the daily life of many surgical specialties which could no longer function without it, as is the case of urology or otolaryngology. In other cases, endoscopy has enabled procedures which were already being performed a long time ago to be carried out much less aggressively, as happens with joint surgery (e.g. 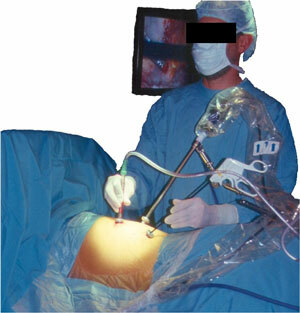 knee arthroscopy) or surgery for abdominal and thoracic cavities. Neurosurgery has not escaped this trend and the use of the endoscope has been spreading slowly but steadily. Many are the procedures that can today be carried out by endoscopy or with the help of the endoscope, and it offers many advantages: it enables us to see the surgical field more closely, it allows us to see in very small spaces and with lenses of different angulation, and we can not only see the front but also the sides and even the back. The endoscope is a very versatile instrument that, if used wisely, provides unquestionable advantages in the surgical field. Neuroendoscopy is thus an important technique used in neurosurgery to reduce damage to tissues, especially nervous tissue, and in the diagnosis and treatment of neurosurgical diseases. This surgical technique is less invasive than the conventional open surgery and so provides a postoperative period which is not only more comfortable, but also less painful and with a lower risk of complications, allowing quicker recovery and reducing hospital stay. Intraventricular catheters to treat hydrocephalus. Ventriculostomy of the IIIrd ventricle to treat hydrocephalus without internal drainage of CSF to another part of the body. Ventricular fenestration of the septum pellucidum and intraventricular septa. Colloid cyst of the IIIrd ventricle. Aqueductal stenosis of the fourth ventricle. Chronic subdural hematoma: to explore the cavity after draining the hematoma and see if there are remains. Cerebellopontine angle pathologies, particularly trigeminal neuralgia. Treatment of peripheral nerve entrapment, e.g. endoscopic decompression of carpal tunnel syndrome or endoscopic decompression of ulnar nerve entrapment at the elbow). Assistance in interventions with microscope to see angles which the microscope cannot see, for the microscope can only see straight ahead and in a very specific angles, whereas the endoscope can see sideways or even backwards. Surgical approach to the anterior skull base. Microvascular decompression of trigeminal neuralgia. Thoracic spinal cord pathology (disc hernia, vertebral body fractures, tumours…). It is particularly useful in complex lesions, such as multiseptated complex hydrocephalus or intraventricular tumours and cysts, where endoscopy is the first surgical technique to be considered. Endoscopic surgery is already used regularly to treat skull base lesions, complex hydrocephalus and cranial malformations (craneosinostosis). Access in these cases is made through small incisions, thus implying lower surgical risk as well as a reduction in hospital stay and in blood loss, compared to open surgery. Neuroendoscopy is currently a tool for daily use in neurosurgery and can be applied as a primary technique for lesion approach or as a supplement to open or stereotactic-guided surgery.